My mom got me started on a new author, and sent me home with a box full of books, mostly by this author. Fortunately, I love her style. While the stories aren't changing my life, the characters are very engaging, which makes for some good 'escapism' reading. 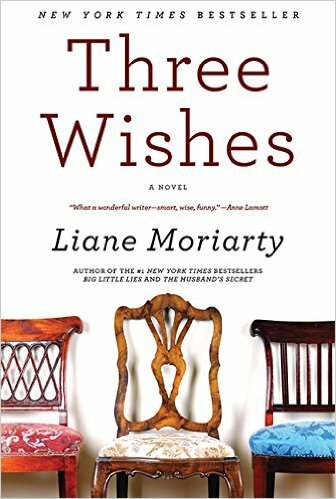 The first book I ready by Liane Moriarty (and I believe the first book she wrote) is Three Wishes. I've listed this as a 'book about an interesting woman' for the purposes of this year's reading challenge. Three Wishes was actually about the Kettle sisters - triplets living very different lives. The book opens with the girls' birthday lunch, which apparently most of the city will be talking about for days. The rest of the book is essentially a flash-back, leading up to the exciting lunch. Gemma is the non-identical triplet. Footloose and fancy-free, she enjoys house-sitting for a living, while maybe dabbling a bit in stocks, but mostly marching to the beat of her own drummer. Lyn has her life put together With her own business, a successful and attentive husband, a fifteen-year-old step-daughter, and a toddler, she's known the 'right' things to do practically since she was born. Cat is also married, but after really living her life and enjoying her marriage, she and her husband think it's time to settle down and move to the next step of their lives as adults. Things, of course, don't always go as everyone plans. I found this book hard to put down as I wanted to see what happened to the sisters, and how it all lead to the dramatic restaurant scene. Glad you enjoyed it. I found Laine Moriarty's books got better after the first one. Oh, she is good. You've got to read...now I can't think of the name. Trust me, keep reading. Thank for sharing this! Will look the author up.